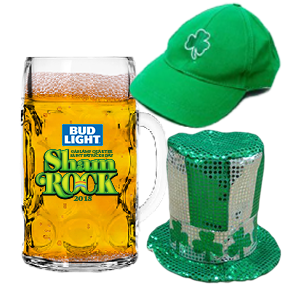 Round up your leprechauns, don your green attire, grab a pint and Let the Shenanigans Begin! Come celebrate shamROCK's 25th year and paint the Gaslamp Quarter green with Irish revelry across 50,000 square feet of green astroturf, 3 stages, an ALL NEW shamROCK Shenanigans block & MORE! Celebrate St. Patrick's Day weekend at San Diego's biggest BLOCK PARTY in the streets of the Gaslamp Quarter with heart pounding sounds, authentic Irish entertainment including Irish bands & dancers, Bud Light green beer, Tullamore Dew Whiskey libations and an all new Shenanigans party block with oversized games, contests, photo opps & MORE! Not only does your pass include entrance into a land of green astroturf, shamrocks and rainbows BUT drink specials and free cover at over 25 participating bars and restaurants! Go for GOLD & Upgrade your shamROCK experience to enjoy St. Patrick's Day with the most exclusive block party benefits! • Access to the Exclusive VIP Lounge, VIP Restrooms, and more! Attend both shamROCK & WCKD Village (Saturday, October 26, 2019)! Ticket for WCKD Village will be emailed to you at a later date. Attend both shamROCK & WCKD Village (Saturday, October 26, 2019) as a VIP! Ticket for WCKD Village will be emailed to you at a later date. I would like to donate to the Gaslamp Quarter Historical Foundation to help in preserving the architecture, culture and history of the Gaslamp Quarter. This event is Irish mist or shine. Celebrating 25 years of Irish revelry, San Diego shamROCK is back and better than ever to paint the Gaslamp Quarter green with San Diego’s largest Saint Patrick’s Day block party. Drawing more than 20,000 attendees from across the U.S., this annual celebration is known for taking this legendary holiday and turning it into an outrageous experience for the green at heart to enjoy! Frolic through a clover field with your green Bud Light beer or Tullamore Dew whiskey libation as 6 blocks of the Gaslamp Quarter get covered with over 50,000 square feet of luscious emerald green astroturf! Bust out your best jig with performances by traditional Irish steppers, or shake your clovers across 3 stages of non-stop live music including nationally recognized Irish rock and Celtic bands, top DJs and more! Feeling lucky? Make way to the ALL NEW shamROCK Shenanigans Block for a variety of Saint Patrick’s Day-themed games, photo opps and contests! "Sláinte" (cheers!) to 25 years with shamROCK's exclusive anniversary beer, "Who's Your Paddy IPA", brewed by 10 Barrel as we celebrate with an additional 2 hours of Celtic-inspired festivities from 2pm to Midnight! Grab your friends, don your green attire, and head to the Gaslamp Quarter THIS SATURDAY - March 16! Experience firsthand the Emerald Isle of the West Coast at shamROCK! 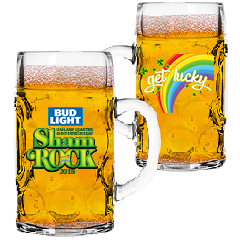 ALL NEW shamROCK Shenanigans block with games, contests, photo opps & MORE! The main entrance for shamROCK is on the corner of 5th Avenue & G Street. This event is 21+ and you will be required to show a government issued ID at the gates. No weapons or fake weapons are allowed. This event is rain or shine. Groups of 10 or more qualify for a group discount. Contact events@mcfarlanepromotions.com for more information. VISIT SANDIEGOSHAMROCK.COM FOR MORE INFORMATION!